Thermocoax Isopad IHH-ST4A/ST4D is a flexible heated hose for liquid and gaseous media with a maximum operating temperature of 400°C. The standard versions of the IHH-ST4A/ST4D heated hose have corrugated stainless steel inner hose constructions with stainless steel braiding for pressurised operation. The thermal insulation consists of high temperature fleece and silicone foam and mechanical protection is provided by a stainless steel braid and soft EPDM endcaps. 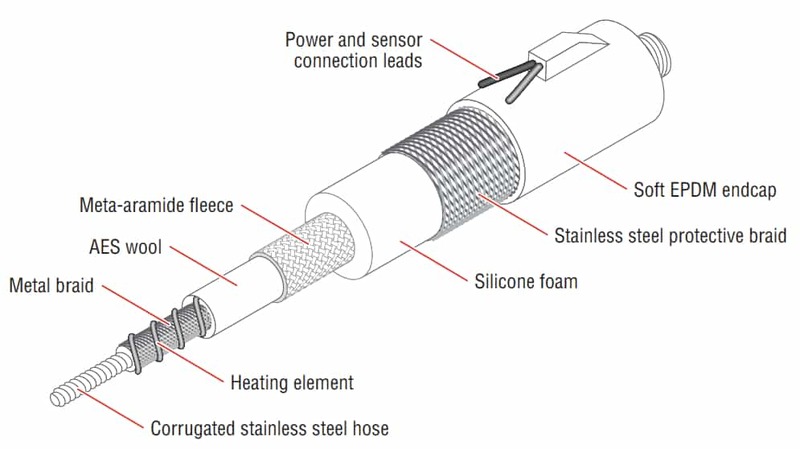 Built-in Pt100 sensors provide optimum temperature control for the medium and homogeneous heat distribution is achieved using evenly wrapped resistance heating cable throughout the hose. Sensor types, e.g. thermocouples Type K, Type J, etc. Dynamic performance represents two dimensional single piston stroke per second (1 Hz) with compressed air (medium) 6 bars at 100°C operating and 20°C ambient temperature. ➡ ATEX heated hoses are available for Zone 1 and Zone 2 hazardous areas.